These infrared images of the planet Uranus show a white spot that is actually a massive storm on the planet. This image was recorded by the Keck II telescope atop Mauna Kea in Hawaii on Aug. 6, 2014 in the 2.2-micron wavelength. Uranus is finally having some summer storms, seven years after the planet reached its closest approach to the sun, leaving scientists wondering why the massive storms are so late. The usually quiet gas giant now has such "incredibly active" weather that some of the features are even visible to amateurs, said Imke de Pater, the project's lead researcher and an astronomer at the University of California, Berkeley. Astronomers first announced the extreme storms on Uranus in August, and have been trying to understand them ever since. "This type of activity would have been expected in 2007, when Uranus' once-every-42-year equinox occurred and the sun shined directly on the equator," research co-investigator Heidi Hammel, of the Association of Universities for Research in Astronomy, said in a statement. "But we predicted that such activity would have died down by now. Why we see these incredible storms now is beyond anybody's guess." But here's where the mystery comes in: As far as anyone can tell, Uranus has no source of internal heat. Sunlight is thought to be responsible for changes in its atmosphere, such as storms. But the sun's light is currently weak in Uranus' northern hemisphere, so scientists are puzzled as to why that area is so active today. Amateur astronomer Anthony Wesley of Murrumbateman, Australia, captured these images of Uranus on Sept. 19 and Oct. 2 of 2014. They show the dramatic appearance of a bright storm on the gas giant, scientists say. 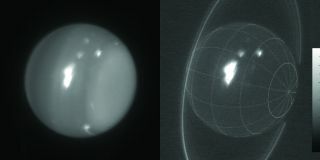 De Pater's team tracked eight large storms in Uranus' northern hemisphere when observing the planet with the Keck II telescope between Aug. 5 and 6. One storm stood out from the rest: Shining in 2.2 microns, a wavelength sensitive to clouds in the tropopause (just below the stratosphere), it made up 30 percent of all of the light reflected from Uranus. Another storm, visible at 1.6 microns, could even be seen by amateur astronomers. One observer, Marc Delcroix from France, photographed it with his 1-meter telescope. "I was thrilled to see such activity on Uranus," Delcroix said in a Keck Observatory statement. "Getting details on Mars, Jupiter or Saturn is now routine. But seeing details on Uranus and Neptune are the new frontiers for us amateurs, and I did not want to miss that." Based on the colors and structure of the storm spotted by amateurs, professional astronomers believe it could hint at a vortex deeper in the atmosphere — similar to phenomena spotted on Jupiter, such as the Great Red Spot. Follow-up observations with the Keck II telescope revealed that the storm was still raging, although it had changed its shape, and possibly its intensity. Also contributing to the effort was the Hubble Space Telescope, which examined the entire planet of Uranus Oct. 14 in several wavelengths. The observations revealed storms spanning several altitudes, over a distance of about 5,592 miles (9,000 kilometers). "If, indeed, these features are high-altitude clouds generated by flow perturbations associated with a deeper vortex system, such drastic fluctuations in intensity would indeed be possible," said Larry Sromovsky, a planetary scientist at the University of Wisconsin-Madison who performed the newer work.